These DIY Makeup Remover Pads are a cinch to make and making your own DIY Makeup wipes will save you a bundle! Confession: I’m not the greatest when it comes to skin care. I don’t always use moisturizer, I rarely use toner, and I almost never take my make up off at night. You might ask why then I decided to make these DIY Makeup Remover Pads – I’ll tell you, it’s for my sister Kate, queen of black eyeliner. She’s partial one brand of make up remover cloths, which, though expensive, she swears by. 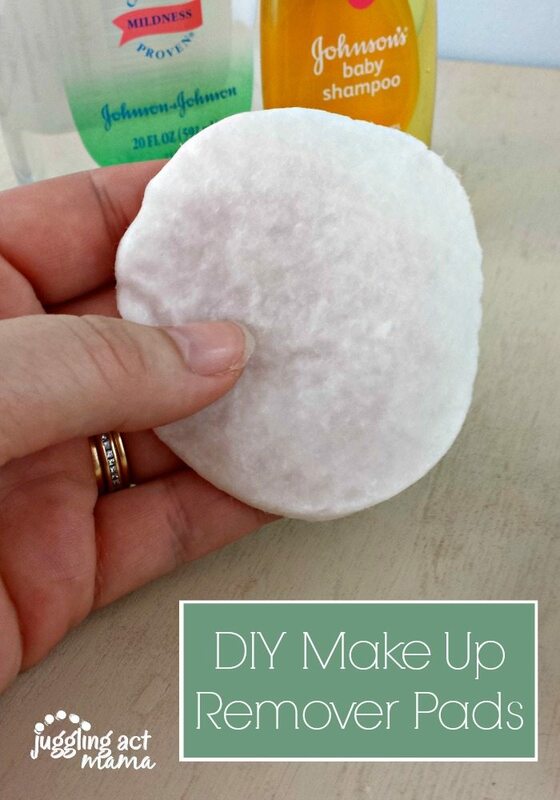 I wanted to see if these DIY Makeup Remover Pads would work as well as her pricy cloths so I decided to give it a go. These are soft and gentle on your skin, but still do a great job of removing make-up. My skin felt, fresh and clean afterward. The best part? They cost less than $1 per jar to make! 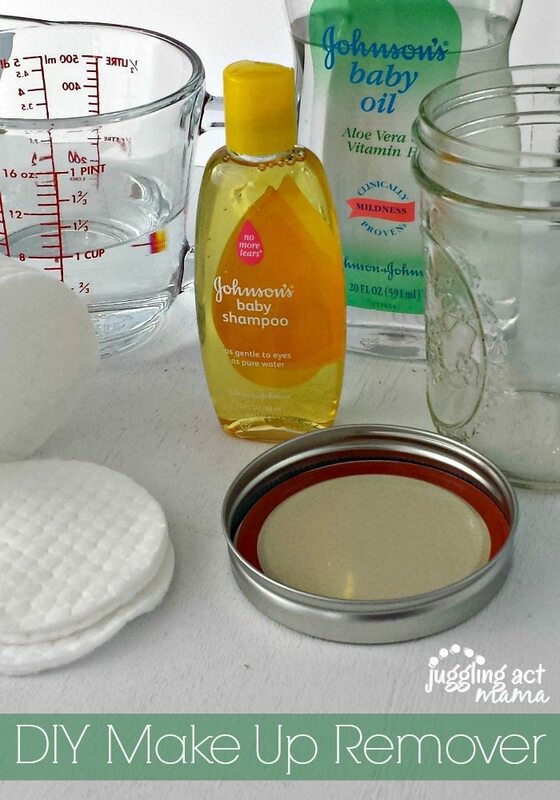 Mix the water, shampoo and baby oil in a measuring cup. Pour a little bit into the canning jar and place about 5 or 6 pads on top. Gently press down until the pads absorb the liquid. Continue adding liquid and pads until the jar is full. I used about 40 pads. Everyone Loves DIY Makeup Wipes! I have to tell you friends, this is one of my post popular posts of all time. It’s been featured on Shape Magazine, Cosmo, All You Magazine and DIY Magazine, too. 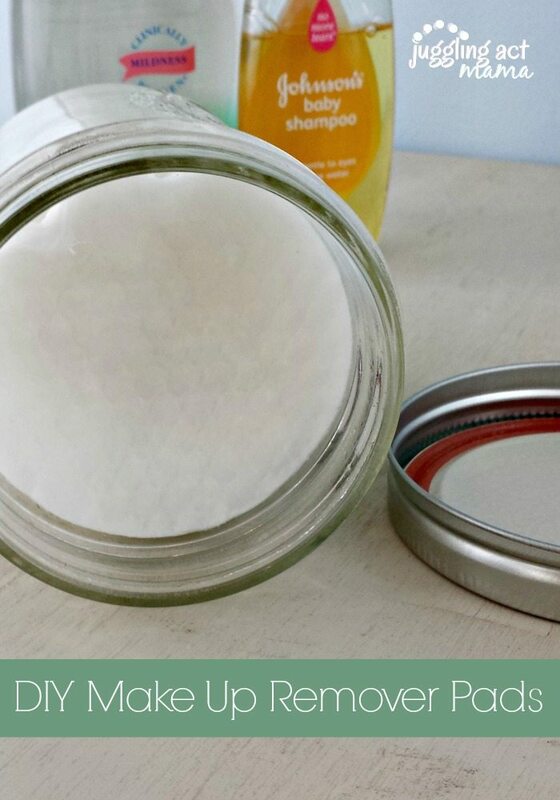 Making these DIY MakeUp Remover Pads is as simple as that! And remember my DIY Make Up Organizer? That’s what you see in the background in the image above – get the tutorial here. I’m trying this out right now, I love projects with supplies I have around the house! Jessica, thanks so much for your note, I can’t wait to hear how you like these! I LOVE this! I spend so much money on make up removers and cloths – I can’t wait to try this! Cool DIY! I’m going to have to try this…well, later once I wear makeup more than every 6 months or so lol. Definitely have to save for later! Great post! And so clever!! Can’t wait to try this out for myself. What a great idea and so easy. Thanks for sharing. I love products that aren’t expensive and can make myself. Happy SITs Day too! Hi, visiting you via the SITS girls. Very nifty idea! Thanks for sharing. Wish you the best with your blog! I can’t wait to try this BUT I (think) am allergic baby oil. Is there something else I can replace the baby oil? I might have aloe oil somewhere in the house, but (if I can’t find it) Is there another substitute for baby oil? Linda, I’ve never tried it with another oil but would be interested to know how aloe oil works for you! Thanks for your note Melissa – I hope you can try these soon. They last a long time (about 40 days/nights) and they’re so cheap to make! This is GENIUS! I am making these this weekend! I have some adult acne and do not find that it negatively affects my skin. I have been using this for years and love it. I hope you will, too! Wow, this is amazing will be trying this out! Very nice tips and Blog! !